Henry (Heinrich) Blank was born on December 14, 1882 at 43 Willow St. Hoboken, New Jersey to Heinrich Blank, age 34, born in Bremen, occupation, shoemaker, and Mina "Erzmeier" (Erxmeyer), age 36, born in Hanover. Henry Blanck married Marie Wellinger before 1905. They were listed in the 1905 census together. Eva Marie Blanck September 17, 1906, 808 Willow Street Hoboken father Henry Blanck, age 23, mother Marie Wellinger, age 22 1st child of the mother. 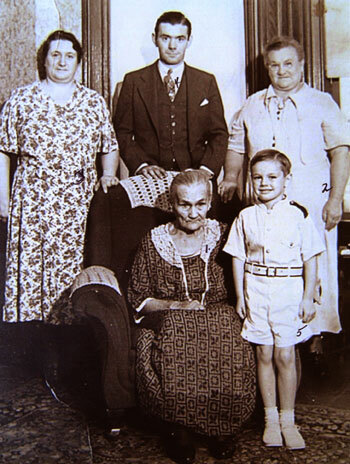 John Henry, the son of Henry Blank, driver, and Marie Wellington was born on February 4, 1909 at 813 Willow St. in Hoboken. Marie Blank born on February 4, 1917 at 813 Willow Avenue, Hoboken. Death: Marie died on October 25, 1919, age 1 year, 8 months and 21 days of pneumonia. She was buried in the Erxmeyer-Blank family plot in Grove Church Cemetery. Catherine Blank, 1 day old, the daughter of Henry and Marie Blank, died on January 1, 1919, cause of death, premature birth, 813 Willow Avenue (New Jersey Death Certificate). She was buried in the Erxmeyer-Blank family plot in Grove Church Cemetery. Henry was listed with his parents in the 1900 census. The 1917 draft registration lists Henry Blank, at 813 Willow Avenue, Hoboken, New Jersey, age 35, born on December 14, 1882, occupation, porter for Eppens Smith Co., 107 Warren Street, New York, New York, next of kin, his wife, Marie Wellington Blank, physical description, medium height, stout build, gray eyes, brown hair. Note: Eppens, Smith and Wiemann company was a wholesale tea and coffee dealer located on Washington street in New York City. It founded by Frederick Eppens. George Fisher, age 55, born Germany, drainer home? I remember very vaguely Henry Blanck, but I do recall Marie and Eva Blanck. My impression was of stately women, who were always dressed very nicely with full make-up and not a hair out of place. They always wore perfume and smiled alot. Of course, these are memories of a young child, perhaps about 60 years ago, so its quite possible, I recall only one but time may have blurred them into two. I remember that they visited my grandmother Frances Schadewald Holmesand her sister Mabel Wursthorn many times. The information from this tombstone may not be complete. I just happened to spy the name Blanck when I was in the cemetery looking for another grave. I quickly wrote down the information and only later discovered that it was the grave of Henry Blanck, junior the son of Henry and Melosine Blanck. Marie was the wife of Henry Blanck. Eva Wellington was Marie's mother. Who was Michael F Lyons, Jr? the 1910, 1920 and 1930 censuses in Weehawken listed him as the son of Michael F Lyons senior (a police man in the city police department) born Ireland and his wife, Elizabeth, born NJ of Eng/Irish parents. Not listed 1917 WWI Draft Registration. Not listed SSDI. A 2006 visit to the cemetery shows that the grave stone has been changed and is not the same as it was about 6 years before. The name is now spelt BLANK. Instead of a more or less rectangular tombstone it is now an abbreviated obelisk. Unfortunately, I do not have a picture of the original tombstone. Darlene, who emailed me in March 2005 says that the grave also includes Annie Schroeder nee Wellinger, born Sept. 13, 1880 died Sept. 18, 1913 and that Louis C. Koehler Jr. was born Aug. 19, 1880 died March 23, 1919 only 39 yrs. old. Darlene contacted me by email in March 2005 and provided the following information. Celile B Champagne contacted me by email and regular mail in May 2007 and provide copies of New Jersey birth, marriage and deaths records for the Wellingers. I have made some additional notes where indicated in blue. Birth of Eva Gresser: Eva Gresser is believed to have been born in Hessen, Germany to _____ Gresser and Anna ______ Gresser. Birth of George Wellinger: George Wellinger is believed to have been born in Switzerland. Died 1887 at age 38. Birthplace Germany per death record. Birth: Annie Catherine, b June 16, 1875. Marriage: Rudolph Hermann Valentine Schadewald, married Anna Catherine Wellinger on 8 Mar 1891, 135 Hudson St., Hoboken, Hudson, New Jersey. Rudolph Hermann Valentine Schadewald was the son of Rudolph Leopold David Schadewald and Therese Wilhelm born 20 May 1867 Union Hill, Hudson, New Jersey. He died 18 June 1919, Christ Hospital, Jersey City, New Jersey. 1900 Census: Willow Avenue Hoboken, Rudolph Schadewald head May 1867, age 33, teamster, Kate wife June 1784 age 25, married 10 years 6 children 2 living, Francis daughter Oct 1892 age 7, Eva daughter age 5 Nov 1894. 1910 census: 719 Clinton Ave Hoboken Herman age 33, shipping clerk, coffeehouse, born New York, Carrie wife,age 30, married 3 years, o children, born New York. WWI Draft Registration Herman Wellinger: Herman John Wellinger, 627 Willow Ave Hoboken age 41, born January 20 1877, US, porter Eppens Smith and Co. 103, 105, 107 Warren Street, New York, wife Mrs Wellinger 627 Willow Street Hoboken, tall medium build, grey eyes brown hair, defect in one eye (left). 1920 census: Willow Ave Hoboken Herman age 42 coffee inspector wholesale, born New York, Karoline wife, George son age 6, May E daughter age 4, and Susan Cenger (Cruger) mother in law, age 72 button sewer at home. 1930 census: 627 Willow Ave Hoboken Herman age 51, radio, rent $26, coffee taster coffee house, born New York, Carrie, wife, age 49, born New York, George son age 17, helper factory, May daughter age 14. Mrs Caroline Wellinger: Caroline Wellinger, 45, of 619 Willow Avenue Hoboken died at her home Tuesday following an extended illness. Surviving is her husband, Hermann Wellinger. The funeral will be Saturday with a requiem mass at 10 o"clock at the Church of Our Lady or Grace. Interment will b e in Holy Name Cemetery. The funeral arrangemnts are in charge of Earl F. Bosworth. Herman J Wellinger, 76, of 259 12th Street , Hoboken died yesterday at his home. Death caused by a cardiac condition form which Mr Wellinger had suffered for many years. A natve of Troy, N. Y. he had spent the greater part of his life as a resident of Hoboken He retired several years ago from the employe of Lawyers Printing co.
Mr Wellinger was predeceased by his wife, Caroline (nee Cruger) who died in 1932. He is survived by a son, George, and a daughter, Mrs. Mae Blue. He was a brother of Mrs. Mamie Blanck. Also surviving are 5 grandchildren. Funeral and services will be held at Bosworth, Funeral Home, 311 Willow Ave, Hoboken Saturday at 2 p.m. Rev Mr Albert W. Eastburn, Trinity Episcopal Church, Hoboken officiating. Interment will follow in Flower Hill Cemetery, North Bergen. Marriage: Henry Blanck, see above. Note: It is hard to read the name could be either Weillinger or Wellinger. Clearly based on the names of the wife and children and their ages this is the correct listing. Death of George Wellington: George Wellinger committed suicide due to a painful disease. Death of Eva Gresser Wellinger: Eva Wellinger, 17 Forth Street Weehawken, New Jersey, widowed, widow of George Wellinger, born August 15, 1850, age 88 years, 2 months and 19 days, birthplace of father, Germany, name of father, ______ Gresser, birthplace of mother, Germany, name of mother, Anna, died November 4, 1938 of chronic endocarditis senility, informant, Mrs. M Blanck, 17 4th Street Weehawken, buried Flower Hill Cemetery Nov 7, 1938. (Death Certificate supplied by Alice, August 2006). Some of the following information on the Schadewalds was taken from the LDS internet site at the suggestion of Darlene. Marriage: Ernestine Phillippine Christine Duetzel or Ditzel on 30 September 1838 Buecheburg, Schaumburg-Lippe, Germany. Civil War: Note from Darlene: Rudolph Leopold David Schadewald used the name Bier in the civil war. Bier was his stepfather's name. 1900 Census: Madison Street Hoboken, Rudolph Schadwald, Mar 1841, New Jersey, varnish polisher, Tressa, wife, Dec 1840, married 35 years, 12 children 5 still living, born Germany, immigrated 1858, Franz, son, August 1879 New Jersey, varnish polisher, Franz Winter, brother in law, age 50, born Germany, day laborer, Charles Winder, brother in law, age 20 born New Jersey, grocery clerk. Melosine Erxmeyer, mother of Henry Blanck, jr.